GODAN (Global Open Data for Agriculture & Nutrition) supports the proactive sharing of Open Data to make information about agriculture and nutrition available, accessible and usable to deal with the urgent challenge of ensuring world food security. Read about recent GODAN’s activities in this direction! “The data revolution has the power to transform the world as we know it” (Global Partnership for sustainable development data). The concept of Open Data – especially in agriculture - is going to be answering some big questions about the future of global food security, and undoubtedly the benefits of data-sharing in agriculture are most keenly felt by farmers and rural communities (How can we improve agriculture, food and nutrition with open data?, GODAN & Open Data Institute). The Global Open Data for Agriculture and Nutrition (GODAN ) is a rapidly growing group (currently with over 268 partners) from national governments, non-governmental, international and private sector organizations that have committed to a joint Statement of Purpose to make agricultural and nutritionally relevant data available, accessible, and usable for unrestricted use worldwide. GODAN has been incredibly active in the past year to connecting communities through advocacy, research evidence and mapping, and creating strategic partnerships. Along with new partners, GODAN holds numerous meetings, panels, and workshops worldwide. The ICT4D-2016 Conference in Kenya, the Executive Director of GODAN - Andre Laperriere - talked about The Data Revolution: the path to global food security while focusing state of the art and challenges of (open) data in Agriculture and encouraging collaboration and cooperation among existing agriculture and open data activities to help achieve the Sustainable Development Goals (SDGs). At the recent COAR 2016 Annual Meeting & General Assembly in Austria, GODAN and Confederation of Open Access Repositories (COAR) announced officially their partnership in sharing knowledge: open data towards innovation in agriculture and promoting the equitable flow of knowledge across the globe to support science and society. “Through this partnership, and in conjunction with FAO of United Nations, we will address several issues including raising awareness of open access and open science in relation to sustainable development and promotion of policy adoption for data sharing” (New partnership between COAR and GODAN). During the 2016 Thought For Food Global Summit in Switzerland, GODAN and its partner Syngenta worked together to organize an Open Data workshop for the next generation of inventors, doers and dreamers. At the 3rd International Open Data Conference (IODC) “Enabling the Data Revolution) in Canada, GODAN had the opportunity for insightful reflection, including an article on the challenges the agriculture sector must address to unleash its data revolution, and launching a GODAN/ODI discussion paper on the impact that open data can achieve in the agriculture and nutrition sectors through 14 diverse case studies. At the Africa Open Data Conference 2015 in Tanzania, partners from across the continent participated and shared their Open Data stories at the partner meeting and panel session. It was a GODAN’s first partner meeting and conference outside of North America and Europe, where GODAN took the conversation one step further to address four key issues: (1) approaches for Africa for Africa; (2) power and control, (2) sustainable development data, (3) promoting use of open data, highlighting the importance of farmers as data producers as well as users. During the Open Government Partnership (OGP) Summit in Mexico in October 2015, GODAN presented a think piece on open government, agriculture, and nutrition. In November 2015, GODAN hosted the Creating Impact with Open Data in Agriculture and Nutrition Workshop in the Netherlands. Efficiency, sustainable and viable rural economy and supportive governance were identified as main impacts of open data (see: summary report). In December 2015, at the first Global Forum for Innovations in Agriculture (GFIA) Africa in South Africa GODAN presented the Open Data and Farming 101 think piece to introduce the concept of open data to a primarily agricultural sector-based audience. During the GFIA Africa open data session GODAN picked up the conversation at AODC (data governance, data reliability, verification, and quality for farmer representation). After the GODAN partner meeting at the 2015 edition of the International Open Data Conference, GODAN has started to support the inclusion of nutrition in the Global Partnership on Sustainable Data network. GODAN actively promotes open data in the perspective of the agriculture and nutrition, which is crucial to provide space for new partnerships from different backgrounds to connect researchers, farmers & health workers, data scientists, corporations, associations and policy makers. GODAN research (in the spirit of open science) and success stories are an essential focus for the GODAN Secretariat to help the whole partner network better answer the question “Why Open Data For Agriculture And Nutrition?”. A number of GODAN partners, including Syngenta and the Open Data Institute are collaborating to help define a vision for the data infrastructures needed for the global agritech sector responding to food security challenges and recommending a way for nurturing and building a data ecosystem and in making it sustainable. GODAN working groups (WGs) have been created as spaces for partners to address real world agriculture and nutrition problems by aligning Partner activities with GODAN Action Pillars. GODAN WGs are sharing their experiences, ideas and ways forward on how open data can improve agriculture and nutrition while identifying areas where they can improve the availability and quality of their data for better nutrition outcomes. GODAN is currently working on building the Agriculture Data Package to guide on how to make open data available, support the use of open data, and data interoperability. This engagement of GODAN will also identify common standards and practices that can be implemented by International Open Data Charter supporters (included data publishers and data users). 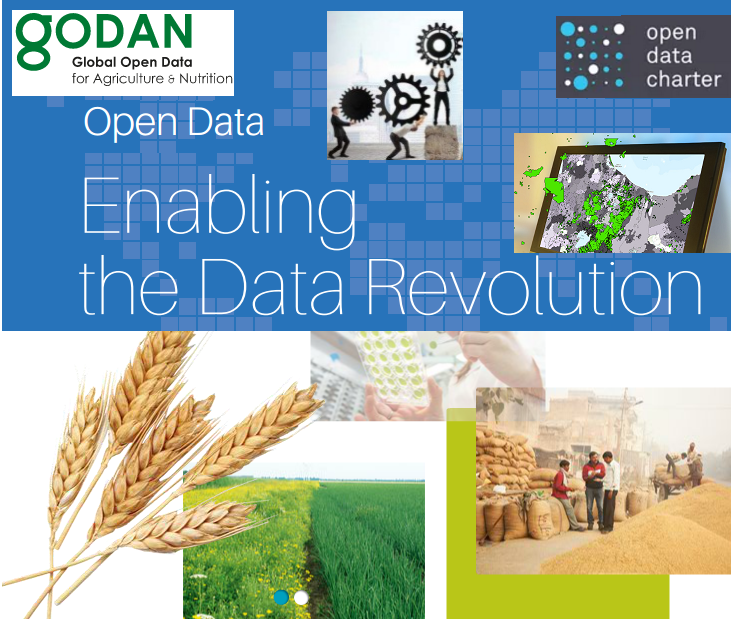 In September 15 - 16, 2016, GODAN plans a Global Summit for all its partners to move forward the Agenda for Open Data in Agriculture and Nutrition, thus also bringing Open Data for agriculture and nutrition into public awareness. The event will present high level commitments to put open data policy at the heart of more organizations approach, release important data sets, and innovate and fund developments using them. Here is a Call to action to assist the GODAN partnership in identifying and filling critical data gaps in agriculture and nutrition required to achieve Sustainable Development Goal 2: End hunger, achieve food security and improved nutrition, and promote sustainable agriculture. For more information on the World Food Prize event see the details of the Secretary's Roundtable on Open Data for Agriculture and Nutrition held on 15 October 2015. You can Sign Up to stay up-to-date with developments during the coming months with regard to the GODAN Summit 2016. For more information about GODAN, visit godan.info, follow daily updates on Twitter at @godanSec and … become a GODAN partner to help support global efforts to make agricultural and nutritionally relevant data globally available and unrestricted!